Walk on Noordhoek Beach between 7.30am-9.00am, and you will see a string of high-spirited race horses exercising on the beach. 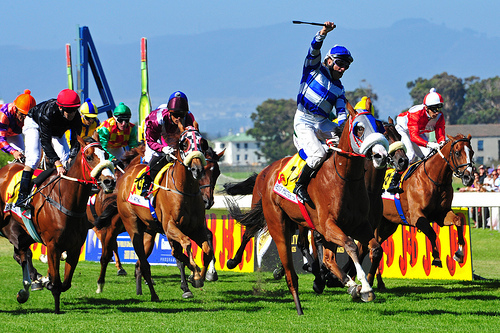 The Dunes Racing Stables trains every one of its 40 or so race horses every morning, in preparation for their next race at Cape Town's Kenilworth or Durbanville race courses. Mondays are always the liveliest, as the race horses only get a stroll on Sundays and are very frisky the next day. These glossy, prancing thoroughbreds are a wondrous sight in the early morning mist on Noordhoek Beach. Mike Stewart is the race horse trainer and owner of the Dunes Racing Stables and has had numerous successes over the past 25 years. The benefits of training in sand and the healing properties of sea water have given The Dunes a reputation for being a therapeutic race horse training centre. Many champions have come out of The Dunes yard, and it’s a thrill to watch them gallop against each other during their beach training sessions. Owning a race horse (or even part of one), may be much cheaper than you imagine. A race horse can give you a great deal of pleasure as you enter the parade ring wearing your Owner's Badge, and it could be you leading your horse into the winner’s box! Chat to Mike about it – he may have just the right horse for you.